Support Topic: Follow-Up PlansWhat’s Different? You might have noticed that we moved a couple of things around during construction. Don’t worry, your current customizations are still active. 2. From the left menu, select any HRA for which you’d like to review your Calls to Action and Emails. 3. Select any Risk Level. 4. 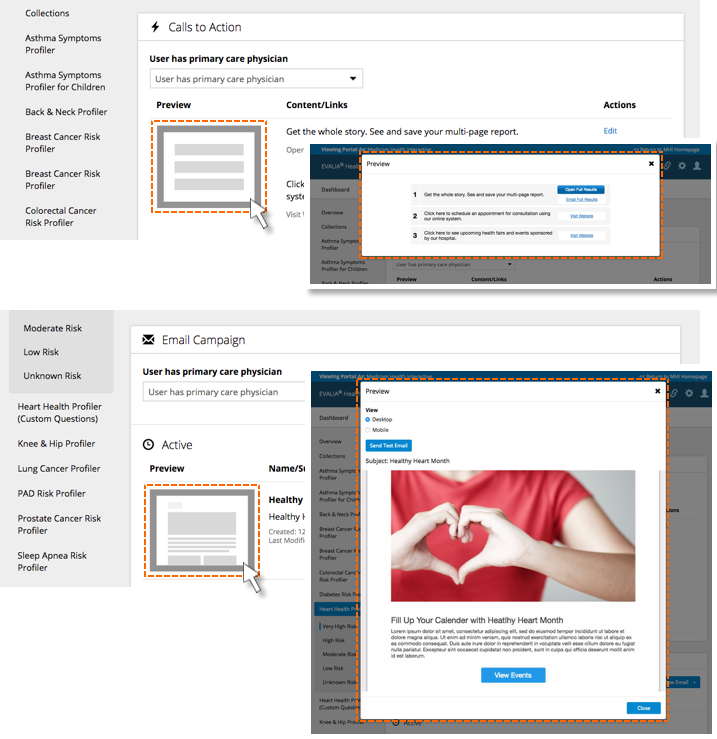 Preview or edit your Calls to Action or Emails. Note: you can select which Calls to Action and Emails to review based on whether uses have a Primary Care Physician. This is now available under the Integrations section. Click the link icon in the top right corner of the portal. This will bring you to the partner integrations page where you can add, change, or delete vendor integrations. Once added, you can also find your vendor integrations under the Follow-Up section. Select the Profiler to which you’d like to add an integration, and scroll to the bottom of the page. Select Edit to edit integrations. What is a Follow-up Plan? What's New with Follow-Up Plans?